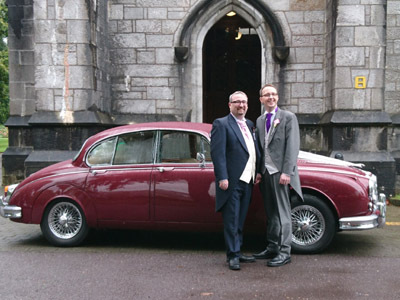 "Eoin and I would like to say a massive thanks to Tom for his service on our wedding day. He was very professional and lovely to have a part of our day. He really went above and beyond with all the small details and we really appreciate that. Thanks again it really was brilliant. Couldn't recommend ye enough." 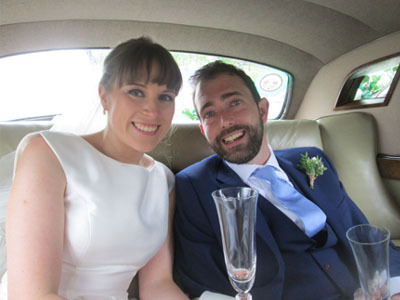 "I want to thank you so much for driving me and my dad and later, me and my new husband, on my wedding day last Friday 11th May. Your jag is absolutely beautiful and the journeys in them made the day so special! So many guests managed to sneak a photo with your car, they absolutely loved it! The journey to Springfort Hall as a new married couple was one of our favourite parts of the day. You were an absolute gentleman and thank you so much for the water and champagne. It was such a thrill to drive in your beautiful car and you made us feel so relaxed and at ease." "From the moment I stepped into the car with my Dad before the ceremony, I knew it was going to be a memorable experience. The car is so immaculately kept and decorated that we felt like movie stars. The water and champagne is a lovely touch. This is made all the better by the driver Tom, who is attentive, professional, discreet but charismatic, thus making the trip even more enjoyable!" "Joan and Tom were an absolute pleasure to deal with from start to finish. From Joan's kind and witty emails dealing with the business to Tom, who was a gentleman on the day. The Jaguar that we had booked looked superb, from the lovely chats to the umbrellas, water he had in the car, just in case, to champagne on the way to the reception venue. Couldn't recommend them highly enough to add a touch of class to your day." "Thank you so much for all you did for us last September! 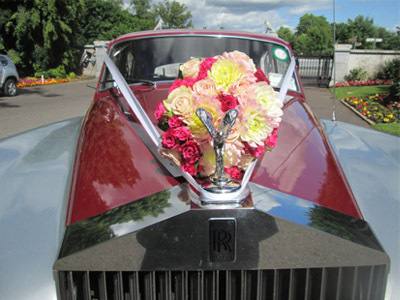 You were more than just a driver, you were easy to chat to and kept us calm and excellent at holding the bouquet!" "Joan & Tom, Thanks so much for all your help in the run up to my wedding. The car was stunning and Tom you really added to our experience. It was a pleasure to have you with us on such a special day and you are a true gentleman. The champagne was delicious also!" "Hi Joan, Please thank Tom for everything on Friday, we had a lovely day, Michelle and Rob loved the Silver Cloud, it was a pleasure doing business with you both." "Thanks Tom! You were great to deal with and the car was lovely. So relaxing being driven by you on the day." "Hi Joan, Thanks for everything in the lead up to my wedding last Saturday, give my thanks also to Tom for his professional manner and his genuine lovely personality." "To Tom, Thank you so much for driving us on our special day, it was a pleasure meeting you." "Thank you for such a great services in the Silver Cloud Rolls Royce and waiting for me 30 minutes late!!" "Dear Joan & Tom, We would like to thank you so much for the amazing job with the car on Saturday, although the weather was against us, you made the day for us!! You will hold a special place in our memories of the day." 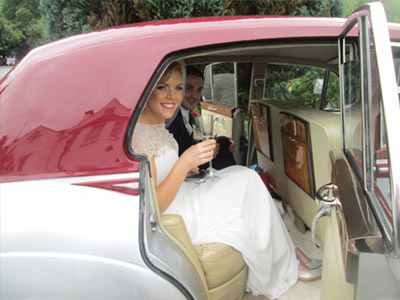 "Thanks so much to Cork Wedding Cars for helping to make our wedding day even more special. The car was amazing and Tom was a terrific driver and great craic. 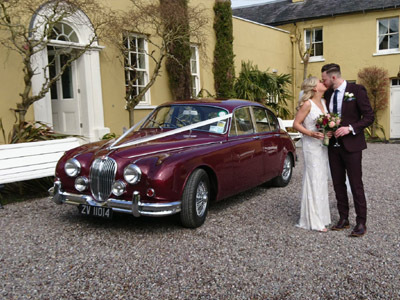 Myself and Garreth would recommend C.W.Cars to anyone looking for a wonderful vintage car for their wedding day." "Hi Tom, We had a wonderful day and your service was part of the experience." "Thanks for everything Tom, we had an amazing day and you were great." "I know its a few months but I wanted to send you a picture of your wedding car on our wedding day. 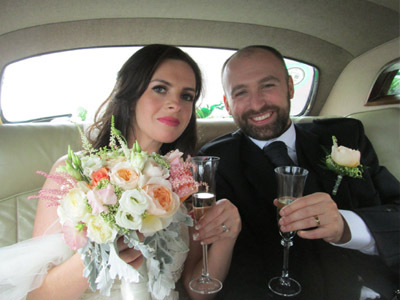 Thank you for being a part of our day.."
"Thanks Tom, we were delighted with the car and trip to Clonakilty."